Success in college doesn’t happen by accident. It happens when a student is prepared for the academic rigors of college, has strong academic and personal support systems, and practices consistent, academic diligence. When a student possesses all of these, they are positioned for success in college. This is a very simplified version of why I believe students succeed in college. However, I do yield to the many other valid arguments of why students succeed in college… the means of success are as varied as the students themselves. Yet, there is one common thread when discussing the success of minority students, specifically American Indian students, in college. The specific thread I am talking about is the importance of their traditional culture in both their academic and personal lives. Being a Native American myself, I can assure you that our varied and unique tribal cultures are very important to us. They are threaded into our lives as an integral part of who we are. As with our ancestors, our unique cultures serve as a link between who we were, which is also who we are, and then, ultimately, who we will become. A little confusing if you are not familiar with Native American cultures… but here it is: The culture helps us stay connected to each other and to the world around us. This brings us back to the topic of success at college for American Indian students and the importance of traditional culture in that experience. I believe that it is important for post-secondary instructors to have a foundation of cultural awareness when working with students from diverse backgrounds. This is important because it helps create an enriching educational, and interactional experience for the students and faculty alike. Often times, having instructors that possess an awareness of the traditional culture of their students can make the difference between students experiencing an engaging and positive college career, or dropping out because they feel alone and isolated from the rest of the student body. It is a victory for everyone when colleges have instructors who possess cultural awareness and understanding. 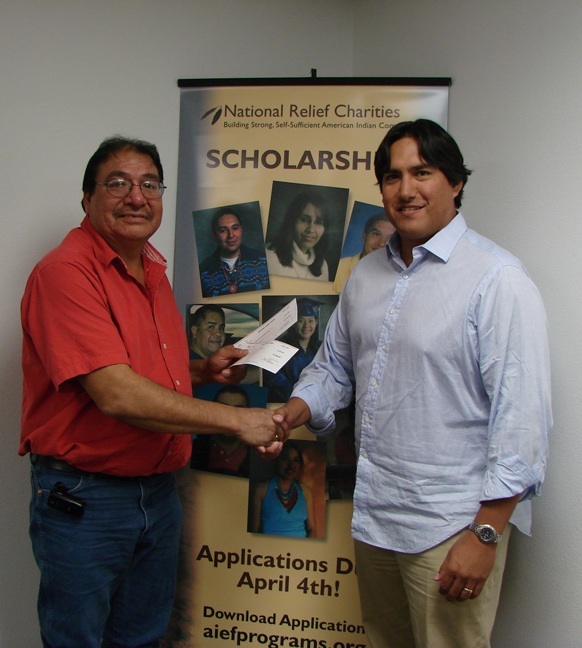 The American Indian Education Foundation, a program of National Relief Charities, works to integrate this factor for success by having a scholarship committee that is very aware of the importance of traditional culture for American Indian students. Every year, when selecting recipients for our American Indian Education Foundation scholarship, the committee works diligently to select students who are ready for the academic rigors and stress of college. Collectively, our AIEF Scholarship Selection Committee brings decades of experience in American Indian education, as well as a strong Native cultural awareness, to the selection process. This is truly beneficial in selecting the right students. And this is evidenced by a 95% completion rate of the college year by the students we select to receive AIEF scholarships. This is an astounding percentage! The norm is about 21%. The American Indian Education Foundation, along with our Scholarship Selection Committee, is honored to play a part in the success of our scholarship recipients. But, we understand that the true stars of our scholarship program are the students. The desire and dedication these students have toward enriching their lives through education is wonderful. And when they can enrich their peers by sharing their traditional culture in a positive, interactional, college environment… well, that is pretty good too! This entry was posted in Humanitarian, Programs and tagged AIEF, American Indian, American Indian Education Foundation, college, Native American, scholarship. Bookmark the permalink. Trackbacks are closed, but you can post a comment. Very nice – love to hear about one of these folks. Thanks!